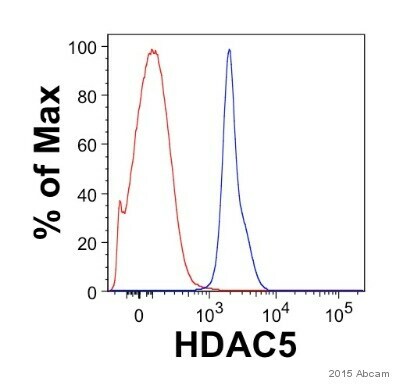 ab55403 detects endogenous levels of total HDAC5 protein. Synthetic peptide corresponding to Human HDAC5. Immunogen range: 225-274. Around Serine 259. Human breast carcinoma tissue and HepG2 cell extract. 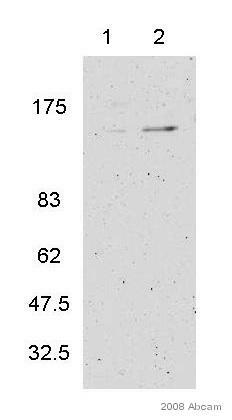 ab55403 was affinity purified from rabbit antiserum by affinity chromatography using epitope specific immunogen. Our Abpromise guarantee covers the use of ab55403 in the following tested applications. WB 1/500 - 1/1000. Detects a band of approximately 122 kDa (predicted molecular weight: 122 kDa). Responsible for the deacetylation of lysine residues on the N-terminal part of the core histones (H2A, H2B, H3 and H4). Histone deacetylation gives a tag for epigenetic repression and plays an important role in transcriptional regulation, cell cycle progression and developmental events. Histone deacetylases act via the formation of large multiprotein complexes. Involved in muscle maturation by repressing transcription of myocyte enhancer MEF2C. During muscle differentiation, it shuttles into the cytoplasm, allowing the expression of myocyte enhancer factors. Phosphorylated by CaMK at Ser-259 and Ser-498. The phosphorylation is required for the export to the cytoplasm. Phosphorylated by the PKC kinases PKN1 and PKN2, impairing nuclear import. Ubiquitinated. Polyubiquitination however does not lead to its degradation. Nucleus. Cytoplasm. Shuttles between the nucleus and the cytoplasm. In muscle cells, it shuttles into the cytoplasm during myocyte differentiation. The export to cytoplasm depends on the interaction with a 14-3-3 chaperone protein and is due to its phosphorylation at Ser-259 and Ser-498 by CaMK. Immunohistochemical analysis of paraffin-embedded human breast carcinoma tissue using ab55403 (1/50 dilution) in the presence and absence of the immunizing peptide. Publishing research using ab55403? Please let us know so that we can cite the reference in this datasheet.